In 2013, Stella Bandu began hosting a number of steeplechase coaching sessions at the Julie Rose Stadium on Wednesday evenings and these have been so successful that Stella is running them again throughout the 2015 summer season. Stella has been a coach for over 20 years and she specialises in coaching middle distance running and she is also Kent’s steeplechase coaching mentor. In 2009 she was appointed by England Athletics to develop their skills to the highest level possible. She was a Great Britain Cross Country Team Coach between 2005 and 2008 and she coordinated the Aqua Pura UK Athletics Steeplechase programme which is designed to encourage more women to take up the steeplechase. See Stella's profile here. Steeplechase is one of the toughest events in athletics where athletes have to run just over 7 lap s of the track jumping over 28 hurdles and 7 water jumps in the 3000m races. The last British senior men’s athlete to win a medal in this event at the Olympics was Mark Rowland who competed in the 1988 Seoul Olympics and won a Bronze Medal in a time of 8 minutes 7:96 which still remains a British record. Women’s steeplechase is still a relatively new event to the Olympics, being introduced at the 2008 Beijing Olympics. The fastest time for a British athlete in the Women’s 3000m was in 2012 by Barbara Parker in a time of 9 minutes 24:24 at Eugene USA. Because this is such a tough event, athletes can only begin competing in the steeplechase from the U17 age group upwards. Athletes who compete in this event need specialised training in how to hurdle and how to clear the water jump safely, as well as having the strength and stamina to complete the distance. In 2014, Tonbridge Athletic Club introduced the 2 lap challenge to the Norman Fowler Open Meeting on Easter Monday which was a huge success with 12 athletes taking part. Ashford Leisure Trust hosted an open meeting on 30th April with 4 men and 5 women taking part in the 1500mSC. Better Athletics hosted a number of steeplechase events during 2014 at Crystal Palace beginning on 10th May with a steeplechase workshop for coaches and athletes and an opportunity afterwards to compete in the 2 lap challenge races and a further workshop on 19th July followed by the 1500m SC at men and women’s heights. Finally on 23rd August Stella hosted a third workshop followed by the 2 lap challenge and the 1500mSC at men and women’s heights. In March 2015, Stella organised and led a Steeplechase workshop for Female athletes. 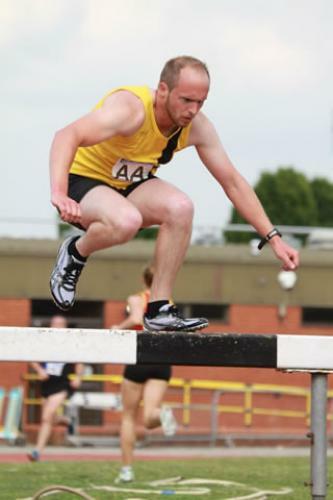 In April Tonbridge AC held the 2 lap challenge and the 2000m steeplechase at their Easter Monday meeting and Ashford Leisure Trust offered athletes the 2 lap challenge and the 1500m Men and Women’s steeplechase. 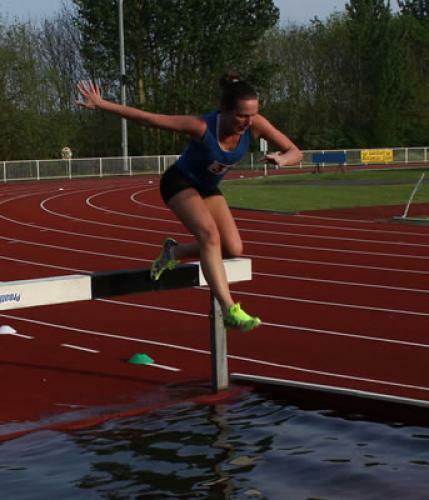 Steeplechase coaching sessions continue at the Julie Rose Stadium on Wednesday evenings throughout the summer – further information will be posted on the website, on the noticeboard inside the chute at the Stadium or see Stella's Facebook page – Coach Stella.